The other great thing about this quick pico recipe, is that is super adaptable in terms of quantity. With the original recipe I found that it was 1) not nearly enough and 2) not nearly enough (oops, did I say that already????). You have to give this a try - it makes store-bought salsa seem like a complete waste of money. Actually, the ingredients here probably total about the same (or less) than a jar of salsa, and it's 10 times better. And if you're wondering what the difference is between salsa and pico, it's mainly in texture as usually the same ingredients are used. 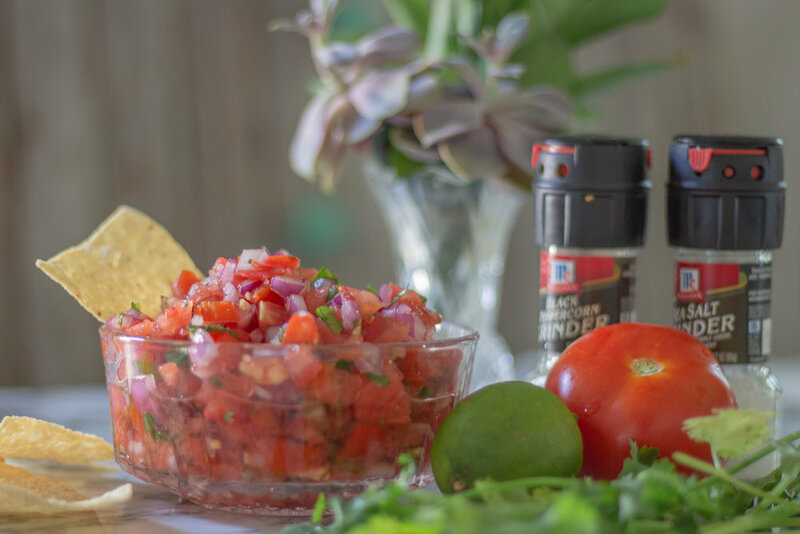 Pico is chunky and always uncooked - you could definitely eat it as a little side salad, although OMG, the chips make it even better:) Salsa is much thinner in consistency...more like a dip. Instructions: Add chopped tomatoes, jalapenos, onion and cilantro to a bowl. Add the lime juice and stir. That's it. SOOOO EASY!!! Salt and pepper optional. If you would like to top with black beans, cook 1 can of black beans (drained and rinsed) with a splash of chicken broth (use it from the below if you're adding chicken) and dashes of chili powder, cumin, oregano and cayenne. Adding chicken? I like to use the Tyson, canned all white chicken breast, which saves a TON of time. I heat it in a frying pan until the liquid has cooked out, with dashes of chili powder, garlic salt, onion powder, cumin and oregano. Hope each of you had a fabulous weekend? What's on your menu this week?